Mary B. Puplava began The Handmaiden in printed form in 1994 in response to a strong urge from the Lord to gather the writings of women and put them in a form to share with others. The quarterly newsletter was mailed around the world and became the source of bible study for missionaries and home fellowship and women’s groups. Originally published in print form, The Handmaiden went into a period of dormancy. In the Fall of 1998, Mary began again to build The Handmaiden for the Internet. Her husband saw her work and asked that she build a site for his internet radio program, Financial Sense Newshour. Unfortunately, her work on The Handmaiden was put on the shelf for a while. She began The Handmaiden Blog in 2010. This final edition streamlines the original site. Since retirement at the end of 2007, Mary enjoyed being a wife, mother of three sons with their wives, and Nana to six precious grandchildren. After 5 years of retirement, she returned to work on a full-time basis. May 1, 2018 Mary was able to truly retire for good. On August 18th, she launched NanaLoveNotes.com and hopes to influence the world around her with wisdom, joy, and old-fashioned values. She attends The Gathering Place Church and is involved in Women’s Ministries and Prayer Team. 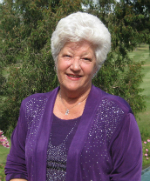 Mary serves on the board of Fig Tree Foundation. For David served God’s purpose for his generation.